Thanks to the Ikelite Updated Underwater Housing and Sony Cyber-shot RX100 III Camera Kit from B&H, you can capture images of coral reefs, pygmy seahorses, and other aquatic wonders at depths as great as 200'. 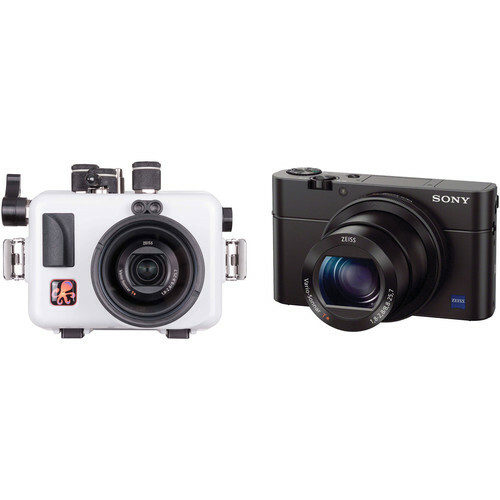 This package provides everything you need for a photo or video adventure beneath the surface, bundling the durable waterproof enclosure with the advanced, 20MP point-and-shoot digital camera, which features a Zeiss Vario-Sonnar T* 24-70mm f/1.8-2.8 lens (35mm equivalent). Add a strobe or video light to your system to ensure sufficient illumination and color accuracy on cloudy days, and when diving beyond 20' or so on clear, sunny days. Capture clear, detailed images of coral, sharks, and more at depths as great as 200', thanks to this updated version of Ikelite's Underwater Housing for your Sony Cyber-shot RX100 Mark III, IV, or V Camera. Two ports for optional Ikelite, Sea & Sea, or Olympus-type fiber-optic cables enable the connection of external strobes. Large, ergonomic mechanical controls, including knurled knobs, a newly added shutter lever, a dial, and push-buttons, provide access to all camera functions except for the flash and viewfinder switches. In addition to the improved shutter lever, the housing offers better zoom control than the previous model. Built for durability, the housing is designed, constructed, and tested in the USA. It's manufactured from a white ABS/polycarbonate blend, which is still corrosion-resistant but also reflects sunlight to keep your camera cooler when shooting at or above the water's surface. The back plate is clear to allow you to monitor the O-ring seal and maintain a full view of the camera. The integrated flat glass lens port has a 3.0" diameter, and accepts optional, external wide-angle and macro add-on lenses for an enhanced view. Optional color-correction filters can also be added to restore colors that get absorbed by the water. The included AC adapter and USB cable permits in-camera charging of the rechargeable Lithium-ion battery. Box Dimensions (LxWxH) 9.8 x 6.4 x 6.3"